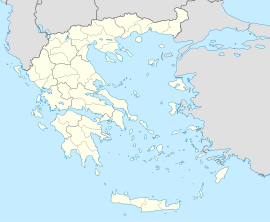 Oropos (Greek: Ωρωπός) is a small town and a municipality in East Attica, Greece. The village of Skala Oropou, within the bounds of the municipality, was the site an important ancient Greek city, Oropus, and the famous nearby sanctuary of Amphiaraos was a large settlement which is visible today. The municipality Oropos stretches between the Parnitha mountains and the South Euboean Gulf, opposite Eretria (on the island Euboea). The town Oropos, the seat of the municipality, is situated on the lower course of the river Asopos, 4 km south of the coast. It lies 4 km southwest of Nea Palatia and 36 km north of Athens. The community Oropos consists of the town Oropos and the nearby villages Kampos and Platania. The municipality has an area of 338.183 km2, the community 11.967 km2. Oropos was founded by colonists from Eretria; it was either located in or identical with Graea. In ancient times, it was a border city between Boeotia and Attica, and its possession was a continual cause of dispute between the two states; but ultimately it came into possession of Athens, and was always an Attic town, even during the Roman Empire. The actual harbour, which was called Delphinium, was at the mouth of the Asopus, about a mile (1.6 km) north of the city. The famous Sanctuary of Amphiaraos was situated in the territory of Oropus, 12 stadia from the city. The site has been excavated by the Greek Archaeological Society; it contained a temple, a sacred spring, into which coins were thrown by worshippers, altars and porticoes, and a small theatre, of which the proskenion is well preserved. Worshippers used to consult the oracle of Amphiaraos by sleeping on the skin of a slaughtered ram within the sacred building. the automobile museum "O Phaeton"
^ Robin Lane Fox, Travelling Heroes: In the Epic Age of Homer (Random House, 2008: ISBN 0-679-44431-9), p. 161. ^ A. Mazzarakis Ainian, "Oropos in the Early Iron Age", in M. Bats and d'Agostino, eds. Euboica: l'Eubea e la presenza euboica in Calcidia e in occidente 1998:197-215. ^ This article incorporates text from a publication now in the public domain: Chisholm, Hugh, ed. (1911). "Oropos" . Encyclopædia Britannica (11th ed.). Cambridge University Press. This page was last edited on 11 March 2019, at 12:03 (UTC).